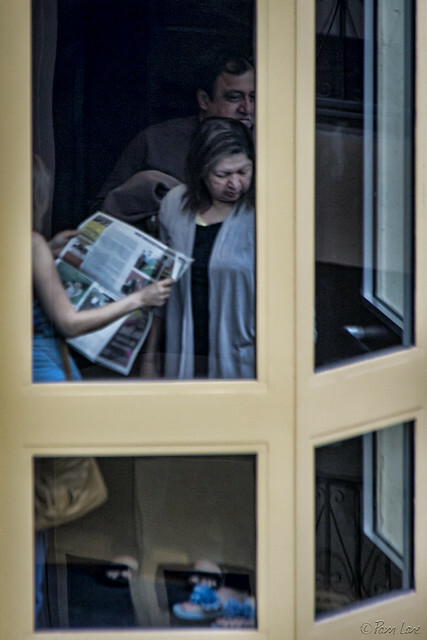 Downey Daily Photos: What's your newspaper style? You know all those quizzes that pop up on Facebook or in magazines? They ask you about your style in some facet of your behavior, and then tell you what this means about your personality. Well, I think there should be a quiz to tell you what your newspaper reading style says about you. 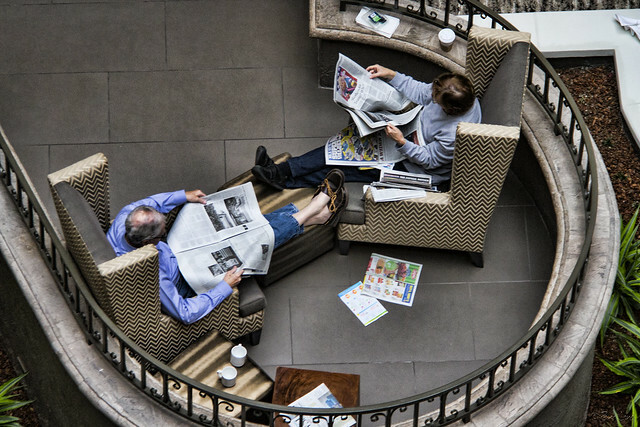 In just a few minutes of people-watching at the Embassy Suites Hotel on Sunday morning, I observed two very different newspaper styles. The first one, above, is relaxed. There's no rush here. The completed (or unwanted) sections of the paper get tossed aside. At the other end of the spectrum, there are those who read on the go. Life's short, there are a million things to get done, there's not a moment to waste. If you can multi-task while reading the paper, so much the better.